ZZYZX, CALIFORNIA–The skies were brilliantly clear early this morning when we left the Desert Studies Center for points west. The price for the passage of the front was a stiff wind that kept up all day and even now is whistling in the darkness past our windows. I don’t mind at all. It reminded me of delightful spring days in the desert when as kids we flew kites so high we could barely see them. 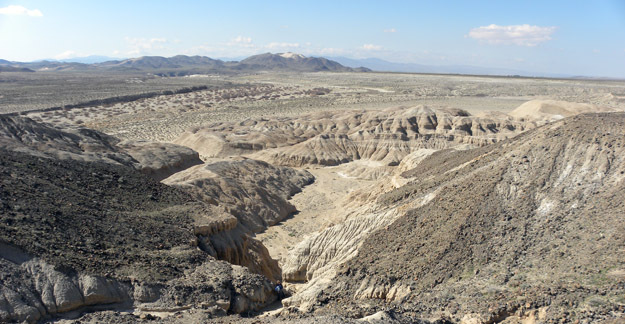 Our first stop was a visit to the extensive sedimentary layers laid down by the Pleistocene Lake Manix in what is now the lower Mojave River Valley. We drove several miles on Harvard Road and walked across long stretches of desert pavement with ventifacts and occasional wind-polished agates. Bottom sediments from the pluvial Lake Manix near Harvard Road. For scale, you may notice Megan Innis and Stephanie Jarvis in the central wash.
We then traveled farther west through Barstow to Owl Canyon and Rainbow Basin a few miles northwest of the city. There we met Buzz and Phyllis Sawyer, childhood friends of mine from Barstow and superb natural historians of the desert. We all enjoyed the diverse facies of the Barstow Formation (Middle to Upper Miocene) as well as the plants and animals in this protected area. Professor Shelley Judge explains the complicated structure of Owl Canyon to her faculty colleagues using traditional geological hand language. 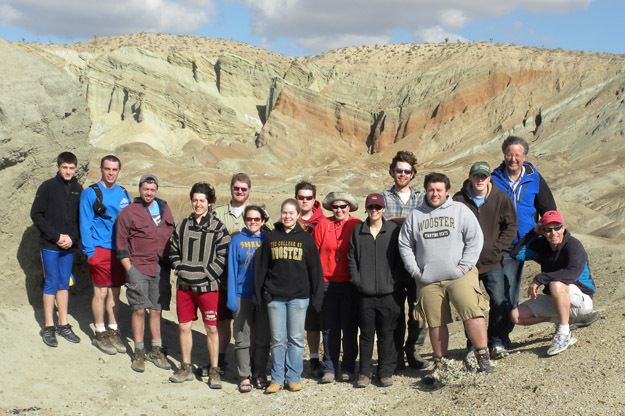 Wind-blown Wooster Geology field trip participants in Rainbow Basin with the famous Barstow Syncline in the background. This photograph was kindly taken by Buzz Sawyer. Our last stop was Afton Canyon where we completed the Lake Manix story by looking at the outlet through which it catastrophically drained into Soda and Silver Lakes to the east. The sun had set by the time we gathered back at the vans, ending another productive and thought-provoking field day. Wooster geologists crossing the mighty Mojave River in Afton Canyon. We don't think this is quite the same river Jedidiah Smith encountered.